The long awaited PlayStation 4 firmware update, 1.70, hit the console today, and in tow, SHAREfactory. 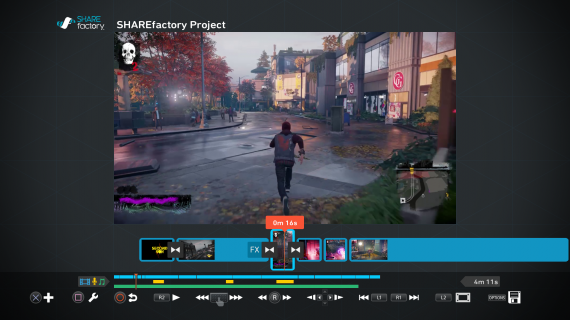 SHAREfactory is a new application that lets you edit your gameplay recordings with ease and pizzazz. The app is free to all PlayStation 4 owners, though you will have to download the app. After you download the app you can take any of your previous gameplay captures and edit them into works of art. The interface , which is pictured above, feels a bit like Windows Movie Maker, which isn’t a bad thing since Movie Maker is extremely easy to use. You can edit the videos, music, transitions, the theme, and just about anything else. This is a tip I got from the Official PlayStation Blog about capturing video for the editor, take short clips like your editing. If you take short clips, it is worlds easier to string them together to make a more cohesive product. There is a simple way to do this. When you have set up what you want to accomplish with the clip simply double tap the share button to start recording, once you are finished tap the share button again to stop recording. Next it will take you a menu where you can simply press square to save that file for later use, and you are finished. SHAREfactory comes with sample music, which I used in my sample video below, or you can use your own simply by putting music on a USB drive and plugging it into the PS4. For that music to work, you need to have a folder on your USB drive labeled /sharefactory/music, with the music you want use in that folder. After you are finished editing your video simply hit options and then render video. Once the video is finished, you can then upload it to social media and grab it for your own use. Both next gen consoles now have video editing software, and we are all better off for it. Previous gen hardware required addition hardware that could be a bit pricey, now everything is simply built in. Having now tooled around in both Upload Studio on the Xbox One and SHAREfactory on the PlayStation 4, I do prefer SHAREfactory to Upload Studio. Upload, as a hub to share and watch videos is fantastic, it just needs some better editing tools. It feels a tad simplistic when you see what you can do with SHAREfactory. Now on the PlayStation 4, I wish there was a hub to upload and share videos, instead of posting them to Twitter or Facebook. Below is a quick video I made in SHAREfactory. The game clips are from Resogun, which I had to play through the first level twice to get the clips right. The audio is one of the standard tracks in SHAREfactory, the whole editing process took me about 15 minutes, so excuse the rough edges. If I took my time and utilized something like the photo mode in Infamous: Second Son, I could pull something much greater from my creative bones. If you have a PS4, I urge you to give SHAREfactory a go and hopefully create something special. Once more, you will find just a lot of things that you do not know or need to know.